Guide on how to easily copy any DVD to laptop (Windows or Mac) with original quality. Digitizing DVD may be a trend if you have some DVD discs at hand, with the merit of disc protection and easier content playback on the move. This post provides two easy ways to help you copy DVD to your laptop, Windows or Mac computer, in a few simple steps, by delivering an ultrafast conversion speed with Nvidia/Intel/AMD hardware acceleration. -	Copy DVD to Windows or Mac laptop in any preferred format, MP4, H.264, HEVC, MKV, AVI, MOV, etc. -	1:1 backup DVD to ISO Image, DVD folder with original quality. -	Support all kinds of DVDs, incl. protected 99-title DVD, music DVD, workout DVD, scratched DVD, etc. -	Fastest DVD copy speed with Nvidia/Intel/AMD hardware acceleration, Multi-core CPU, Hyper-threading tech. Free download and install this best DVD ripper – WinX DVD Ripper Platinum – on Windows 10/8/7 (download it Mac version), then follow the simple steps below to copy DVD to Windows (10) or Mac laptop. Insert the DVD disc into DVD-ROM. If your laptop doesn't have a DVD-ROM, you may connect an external DVD driver with USB and insert the DVD disc into it. Open WinX DVD Ripper Platinum and click "DVD Disc" button to load the DVD content into the program. This software has already checked the right DVD main title for you. In the pop-up output profile window, WinX DVD Ripper Platinum provides hundreds of output formats and device profiles for your choice. For copying DVD to Windows laptop, you can choose MP4, AVI, WMV, MPEG, etc. For copying DVD to Mac laptop, you can choose MP4, MOV, or M4V as the output. But if you've installed some top media players like 5KPlayer, VLC, then you can select more other output video formats as you wish, which are supported by these video players. Click "Browse" button to set a preferred destination folder to store the converted DVD video file. Tick Nvidia/Intel/AMD Hardware Acceleration engine. This DVD ripper will auto check which hardware acceleration tech your laptop supports. Then hit "RUN" button to start copying DVD to laptop at ultrafast speed with hardware acceleration. A full-length DVD movie can be converted to MP4 in about 10 minutes. WinX DVD Copy Pro is another professional DVD copy program designed by Digiarty, mainly focusing on copying DVD to new blank DVD, copying DVD to ISO/Folder, burning ISO/Folder to DVD. You can also use this program to copy DVD to Windows or Mac laptop, namely, 1:1 backup DVD to ISO/Folder without any quality loss by keeping all intact video/audio/subtitles. It also supports all DVD protections just like WinX DVD Ripper Platinum, and enables you to smoothly copy partly-damaged DVD to keep some important data you don't want to lose with its built-in Advanced Bad Sector Recover Engine. Free download it and check the guide on how to use it to copy DVD to laptop. Insert the DVD disc to DVD-ROM or external DVD drive. Run WinX DVD Copy Pro. WinX DVD Copy Pro provides 3 DVD copy modes: Clone DVD to ISO, Copy DVD to Video_TS Folder, and Copy to Single MPEG2 File. E.g. click "Clone DVD to ISO", and then you'll see the source DVD has been selected and the Target ISO folder has been set. You can click "Save as" to choose another preferred output folder to store the copied ISO file. Finally tick all the DVD protection removal options, and hit "RUN" to start copying DVD to ISO stored to your Windows or Mac laptop at superfast speed with original quality. To some extent, WinX DVD Ripper Platinum is a DVD ripper, and DVD backup software, while WinX DVD Copy Pro is a DVD to DVD copy, and DVD burning program. 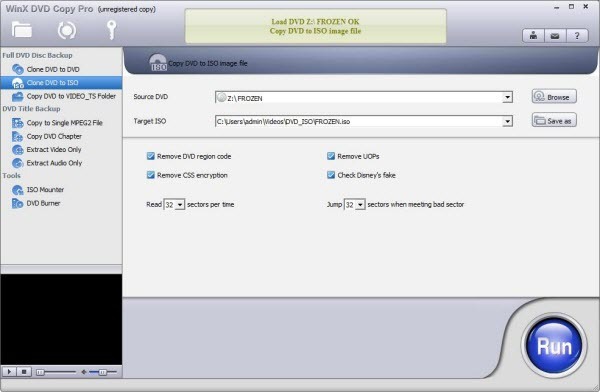 You can choose either of these two tools to copy DVD to laptop based on your own needs.